Sign-up for your monthly fix of design news, reviews and stuff to make you smarter. ZAI SKI FACTORY TOURA detailed look at high-end ski manufacturer Zai's factory located in the heart of the Swiss Alps. IHHS2014A selection of products from the annual Housewares show in Chicago's McCormick Place THE ARMORY SHOW 2014Checkout the work that caught out eye at New York's annual contemporary art show at Piers 92 & 94. MAISON&OBJET PARIS 2014Over 3000 exhibiters showcasing emerging home furnishings, accessories and objects. The iron was on, but the plate was cool to the touch. The realization set in that after two short years of service, the thing was dead. I remember seeing Granddad fix all sorts of household appliances growing up, tinkering and cursing for hours before yielding a re-functional product. So, I, too, set the iron on my workbench to revive it. Right off the bat, I knew this wasn't going to be easy. All of the screws on the outside had a proprietary head design. After some careful work with a needle nose, they were out, but the plastic shells still wouldn't come apart. I pried with screwdrivers, torqued on handles, pulled on snap fits. After finally getting to the metal base, I found it covered in epoxy. By the time all was said and done, my iron lay in a dozen broken pieces on the counter, and I cursed the work of my profession. Profoundly frustrated by this experience, I disassembled the same iron once more, documenting each step to illustrate the pain. Armed with the knowledge from my disastrous first try, it was a bit easier, but still took 67 steps to separate 52 parts. Design for Disassembly (DfD) could have prevented this mess. Ten seconds to full disassembly. 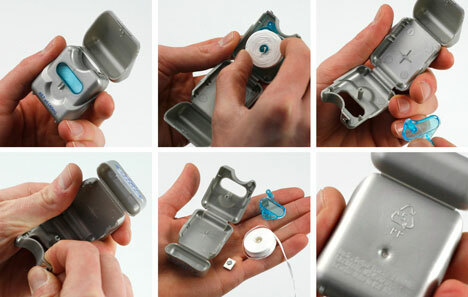 For example, this low-cost floss container embodies the essence of DfD—simple to assemble and disassembled. It's easy to open, free of glues, screws, or heat stakes. The main component's material is clearly labeled, and the parts are quickly separated. Where did DfD come from? Our ancient tools, meticulously crafted from natural materials and intended for repair and reuse, are perhaps the earliest example of DfD. During the 1950's rise of consumerism, fueled by mass production methods, cheap labor, and design fashion, disposability became the norm. Over time, the waste created by planned obsolescence and a throw-away culture was exposed. Organizations studied the negative impacts of toxins found in our product waste and governments began to regulate. In 2004, the European Union passed the landmark WEEE (Waste Electrical and Electronic Equipment) Directive, placing the responsibility of disposing electronic products with their manufacturers. This tectonic shift was recognized as a sign of things to come by global manufacturers, driving interest in the DfD strategy. The Design for Disassembly roadmap. Above is a general How-to-DfD roadmap. 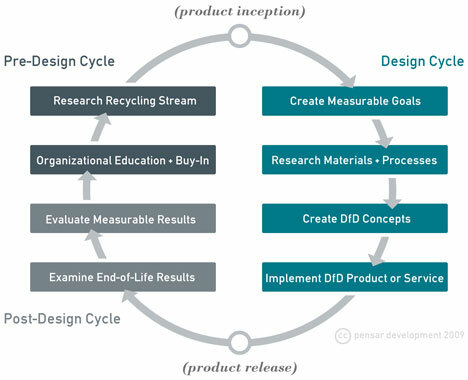 It's not a set path, but a framework of actions that can be performed in almost any order to achieve the end goal of designing more efficient products. As you may expect, for safety reasons, not all products should be disassembled by users. Disassembly of high-risk products (such medical devices, high-voltage electronics, automobiles, etc.) is better left to trained technicians (or MacGyver). With the help of several DfD practitioners, I elaborate on the key steps of DfD below, from the research-based Pre-Design phase to the user testing of Post-Design. If you have experience with DfD, please join the dialogue by posting your tips, techniques, and experiences in the"Designers Accord and Green Design" section of the Core77 Forums (and include "DfD" in the title). Reduction of Labor Costs: Products that disassemble easily often assemble easily, saving the company time and money on labor. Also, if products need to be repaired or refurbished, quick disassembly will save time and effort for the company and keep the customer satisfied. Reduction of Material Costs: DfD solutions emphasize simplicity. 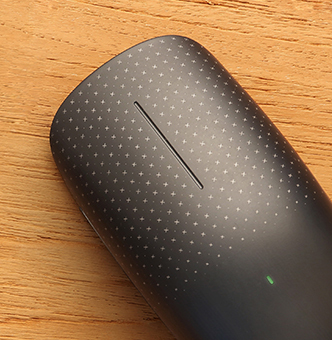 By closely examining the anatomy of a product, designers are often able to find components that can be combined or deleted altogether, saving material and production costs. In addition, when products can be refurbished, the material and production costs are greatly reduced—as with disposable cameras or printer cartridges. Open New Markets: When companies make smart choices, people notice. Honda, a leader in fuel-efficient vehicles, has developed a reputation for building cars that minimize their impact on the environment. "Consumers recognize Honda as a leader in developing efficient cars. Design for disassembly is part of our strategy for building cars that takes end-of-life into account," remarks Jose Wyszogrod of Honda R+D America. Honda actively voices their design philosophy in their marketing, which helps to drive sales with eco-conscious consumers. Systems Thinking: "Having designers understand how they can affect the different groups in the organization is fundamental to designing more sustainable products," notes Phil Berry, President of Sustainable Product Works, and former Director of Footwear Sustainability atNike. "Development teams used to be isolated in silos, but now are working together to find new ways to build products that can be separated into pure materials." By seeing that products can be reclaimed, designers are changing the way things are constructed, so those materials can be re-integrated into the production cycle. Walk the Talk: "If the company has existing mandates, hold the team accountable for reaching those goals," notes Travis Lee, Sustainable Design Lead at Lunar. When companies have established ecology policies, development teams need to remind people of those goals, and then set the bar higher. Sharing Goals with Strategic Suppliers: "Work with your partners to bring new solutions to the table" remarks Jose Wyszogrod. By working closely with manufacturers, Honda developed recyclable faux leather. Not only can the material re-enter the resource stream, it also eliminates the toxic chemicals found in leather production such as chromium. Suppliers are experts in their field and can provide better alternatives if the design team communicates their objectives. Visit Manufacturing and Assembly: Regarding his visits to Nike's Asian suppliers, Phil Berry states "By analyzing the production facilities first hand, we were able to reclaim roughly 15% of material that would have been scrapped. We were also able to develop new techniques of how our shoes were built, allowing for future de-construction." By experiencing the manufacturing process, designers are able to identify complications, delays, and waste certain construction methods and material choices make. While I was at SonoSite Ultrasound, Jake, an assembly technician called out "Hey, Mr. Designer, I heard you're designing the new medical cart..." "Uhhh, yeah" I replied. "This one is a pain to build, so if you have time I'd like to show you some things..." That opened a dialogue that simplified the next three generations of medical cart design, resulting in a $450 cost reduction in parts and shorter assembly time. Develop contacts within manufacturing that you can get unfiltered feedback from. They live the design daily and are a good early indicator of how successful the DfD effort has been. Visit a Recycling Operation: "There is no substitute for getting in the trenches," comments Lee on his visits to the San Francisco Recycling and Disposal. Have a question about how something is sorted and processed? When in doubt, go to the source. Long term + Short Term: To help measure performance, set a series of long-term and short-term goals. "Eliminating paint" would be a simple, attainable goal, for example, whereas "reducing assembly time by 50%" would likely be a much more involved effort. The short-term goals will give the team some tangible results, and help motivate them to continue to work on the long-term efforts. Whether a consultant or corporate designer, don't forget to include DfD goal creation and management in the scope of work and schedule. Written, Visible, + Measurable: Herman Miller's Design for Environment (DFE) policy evaluates products based on three core factors: material chemistry, design for disassembly, and recyclability. "In the product evaluation process, we ask four questions of our designs: Are the materials homogenous? Are common tools used to separate them? Did it take longer than 30 seconds to reverse a connection? And have the components been marked with their material type?" explains Scott Charon, Herman Miller's DFE Program Manager. Each and every component is scrutinized based on these factors and assigned ratings on a spreadsheet score card, allowing the design team to accurately evaluate the results. To keep them from being forgotten, make goals written and highly visible. "Reducing assembly time" is a weaker goal than "Reducing assembly time from 4 minutes to 2 minutes." Keeping track of metrics will also allow designers to illustrate the savings DfD has contributed to the company. Don't wait until the end of the project to refer back to your goals; use routine design reviews to check in on progress. It's not likely you'll hit all of your goals on your first try. Aggressive goals are worth pursuing, learn from and build on each successive product generation. Catalog: The vast array of different materials, processes, assembly methods, and manufacturers can lead to information overload. Create documents to track material, design, and process options and document improvements. Minimize fastener types: In general, decreasing variation decreases cost. If a copy machine has 34 different screw types, the company has to track, order, and stock them...and workers will need to be trained and supplied the proper tools to install them. If the design can be accommodated with just 3 screw types, material costs, management and labor time will be saved. Or designers can substitute screws with in-mold snap hooks. "We have replaced most screws with snap hooks. Screws require manpower to install, and are subject to loosen during vibration," notes Jose of Honda R+D. Minimize material types: If a design can be made of fewer parts and material types, it will be easier to sort and recycle. Take this floss container for example. When it's finished, the entire steel casing can be recycled whole. If the other side was plastic, it would need to be manually separated and sorted for recycling. A floss container comprised of two metal halves and a plastic spool. Avoid permanent fixing (adhesives, co-molding) of different materials: A co-molded toothbrush or kitchen tool will not be recycled. Dissimilar materials cannot be recycled together. Nike had a similar issue with their shoes. "Bonded fabrics prevented them from re-entering the material stream. Instead we investigated ways to stitch or lace the material together," Phil Berry remarked of projects like the Nike Considered boot. "If ultrasonic welding is required, we found spot welding rather than seam welding can allow for future separation," states Travis Lee of Lunar. Avoid toxic or harmful materials and chemicals: "Chrome finishes require toxic chemicals, so with our new vehicles we actively seek alternative finishes," notes Jose of Honda R+D. Processing chemicals and materials like PVC, lead, PBDE, and PBB flame retardants are all known to be toxic, so alternatives should be used. DfD magnifies the relationship between material science and design, requiring the designer to understand the larger implications of the chosen materials. Avoid paint : In-mold plastic color is preferable over paint or metallic coatings. Paint and coatings are costly, wear poorly, and prevent plastics from being recycled. VOC emissions from their application contribute to air pollution and are heavily regulated. For metal parts, powdercoating is a good alternative, offering better durability with a fraction of the VOC emissions. Identify material types : Marking parts with international recycling symbols allows recyclers to confidently sort items into the correct material stream. The User(s) Experience: "Think it all the way through. Visualize or simulate the steps to repair or disassemble the product." says Travis of Lunar. It's taking your Human Factors skills and applying them to the process of disassembly. Every product has many "users": the manufacturing and assembly people, the consumer(s), the service tech, remanufacturing people, and recyclers. It's helpful to map these users and how the design is intended to support their goals. Provide Guidance and Accessibility: Give them instructions that will never be lost - emboss or deboss indicators to guide users through disassembly - because by the time a product needs to be taken apart, the user manual is likely gone. Snaps are beneficial because they eliminate screws, but can be invisible and frustrating if there are no indicators revealing their location. Common tools and fasteners are recommended to ease and streamline disassembly. Products that are difficult to repair or disassemble will be pitched by consumers and shunned by remanufacturing. Design for easy repair + provide access to parts: If it can be worn out, it will need to be replaced, and the design should support that. Batteries, moving components, contact areas are all examples of parts that will need replacement at some point. The challenge is two-fold: make it easy to replace, and make the parts accessible for purchased through a website or reseller. If these two factors aren't considered, the life of the product is severely limited. 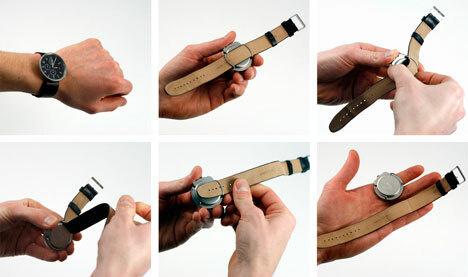 Achille Castiglioni's tool-less method of replacing a watchband on the AL6021 watch. Finding Efficiencies: Sometimes the best DfD solution is to eliminate or consolidate parts. 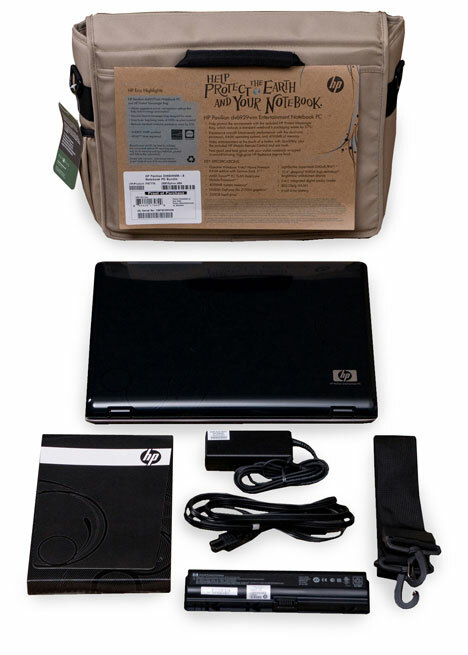 Hewlett Packard's Notebook Division started by reducing the number of parts involved with packaging. "We noticed the number of boxes, manuals, and the foam components that came with a single laptop, and found ways to replace them with alternatives or eliminate them altogether," comments Stacy Wolff, Director of Notebook Design at HP. Foam blocks were replaced with paper pulp shells, with formed compartments to separate the different components and eliminate additional boxes. The user manuals were replaced by a two-gigabyte SD card, which could be re-used with any SD compatible device. Another notebook design produced for Walmart replaced box packaging with a messenger bag-style computer case. The HP laptop bag packaging eliminated several boxes, bags and foam from each computer shipped. It's the user testing that few take the time for, but needs to happen: asking users, remanufacturing lines, and recycling operations "How would you dispose of this?" By confronting the mortality of an object, designers can learn how their decisions impact the end-of-life result. Turn that feedback into goals to share with the DfD team. World-changing design doesn't happen overnight. Instead things evolve incrementally to create a higher standard. Design for disassembly (DfD) is fundamental to improving the cost, quality and longevity of what we produce. DfD delivers on our promise to provide people with better tools for living for years to come. Special Thanks to Phil Berry (Sustainable Product Works), Travis Lee (Lunar), Jose Wyszogrod (Honda R+D Americas), Stacy Wolff (Hewlett Packard), and Scott Charon (Herman Miller) for sharing their experiences and insights. Web Resources: The Maker's Bill of Rights, Ecolect's catalog of materials Lunar's Field Guide to Sustainability, Best Buys Electronics Recovery Program. Alex Diener is the Creative Director/Sketchbook Fanatic at Pensar, a design and engineering consultancy that develops compelling consumer, medical, and industrial technology products. Prior to his work at Pensar, he worked for Ziba and SonoSite Ultrasound developing intuitive technology products and experiences. When not in rainy Seattle, you'll find him at the racetracks of Japan. Research + Pics + Editing by Kristin Will, a Senior Industrial Designer/Observationist at Pensar. In the past, She's also worked for Mixer Group and Lucent Medical Systems creating consumer and medical technology that drives to the heart of user's needs, wants, and desires. My favorite product/container made for disassembly is the Smints' container (http://www.smint.com/). It's only two pieces, yet it works so well. Also, one that I have love since the 80's is the Pop Swatch (similar to the watch above). guidelines that has been around for almost two decades. Before such DfD guidelines are adopted, it is important to know some of their practical and economic limitations. There is a weight limit on parts to which such DfD rules apply - usually around 5 grams for plastics - more or less. Certainly less for precious metals - and more for commodity plastics. This is a crucial point that designers often misunderstand and that needs to be included in such lists of DfD guidelines. Further, increasingly, once valuable and toxic materials have been removed from an assembly using labor intensive methods, the remaining assembly is mechanically shred and machines sort the material fragments into respective streams, somewhat like mining processes. This is increasingly occurring in Europe under the WEEE. Great article! I love the Swatch too! This sounds exactly like the ideas William McDonough and Michael Braungart outlined in their book Cradle to Cradle. Also, bhabicht, as they point out in Cradle to Cradle, aluminum cans aren't really that great to recycle. The tops, and I believe the bottoms, of soda cans are made from a different alloy than the rest of the can. So when they're melted down together, as is usually the case, they create an inferior alloy that can't be used for either part of a can again. As to recycling plastic type "7": unfortunately, there is no such plastic. Rather, it is a semi-useless designation which only means "not 1 through 6". However, by looking past the number to find the individual plastic types, you can find many examples of recycling. ABS plastic is used extensively in consumer products and industry, such as housings for electronics and appliances. TVs, monitors, DVD players, blenders, telephones, you name it: nearly all large rigid plastic molded household items are ABS. It has a large recycling industry, with computers and electronics being a big focus in recent years. PLA (poly-lactic acid) is a newly-popular plastic being touted as biodegradable or compostable. While it won't break down in your garden, it can be composted in an industrial process. Many street food vendors in Portland Oregon provide PLA spoons and forks, and have compost collection bins for food scraps, paper plates, and PLA utensils next to the garbage bin. I found this site that has a free download on DfD. It has a technology called Active Disassembly which appears a more advanced eco technology. If we will design for DfD, the end product will be too expensive. Grumpy Designer brings up some good points. Short term thinking is expensive; whereas long term thinking amortizes cost and puts more money into your pocket. If the parts are going to be designed, shouldn't they be designed well? DFD may not be appropriate for everything, but it's principles can improve most products. You're correct, design itself will not change the world. People with open-minds change the world. This guide is not an opinion piece on green design (or global warming), but rather recommendations to assist designers and engineers in changing the product development processes with the goal of reducing materials, labor, and improving product longevity. I'm making changes in the way I design products because I'm sick of mediocrity. Are you? Almost two years and still a prototype. I even created a strategy for a full life support of this design. I never thought about it, but its only make sens. The auto-motor industry should implement this concept in the engine design.